Given the plethora of equity mutual schemes available today, building an efficient portfolio of wealth-creating mutual fund schemes can be a daunting task for investors. There are star ratings available, of course, but it would be rather imprudent to base your investment decisions entirely on star-rated funds (it can be used just as a starting point). After, SEBI re-categorisation norms, a number of schemes have been merged with each other, undergone changes in the portfolio, and hence, their past performance is not indicative of how they would fare in the future. So, be careful before you go by star-rated funds. Selecting winning mutual fund schemes for your investment portfolio is not an easy task. 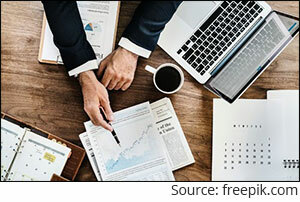 There are a host of factors to consider, both quantitative and qualitative, and requires extensive data analysis before you zero-in on the best mutual fund schemes. So, what's the option then? Select an efficiently managed equity Fund of Fund (FoF) that holds promising mutual fund schemes, which have the potential to build wealth for you, instead of over-crowding your mutual fund portfolio. A Fund of Fund (FoF) invests in units of mutual fund schemes of the same fund house and/or of other mutual fund houses. A minimum of 95% of the scheme's total assets is invested in the underlying fund/s. So, instead of a portfolio of stocks, debt, and money market instruments, the portfolio of FoF comprises of a range of mutual fund schemes in various compositions. Simply with one fund, you can gain exposure to multiple mutual fund schemes managed by various fund managers. The task of selecting worthy mutual fund schemes in the portfolio of a Fund of Fund is left up to the expertise of the fund manager. The fund manager and his team carry out extensive research to short-list mutual funds. If you are a novice, who does not possess the know-how to select winning mutual funds or wants to eliminate the hassle of picking and tracking investment in multiple schemes, consider investing in a Fund of Fund (also known as multi-manager fund). For your equity allocation, a FoF that invests in 7-8 well-researched and reliable equity funds of other fund houses would do well in your portfolio. Which is a worthy equity Fund of Fund? Quantum Equity Fund of Funds is an open-ended Fund of Fund scheme (incepted on July 20, 2009) investing in 5-10 open-ended diversified equity schemes of third-party mutual funds, shortlisted after extensive research. The investment objective of the scheme is, "to generate long-term capital appreciation by investing in a portfolio of open-ended diversified equity schemes of mutual funds registered with SEBI. There can be no assurance of positive returns from following the stated investment strategy." The scheme invests in underlying equity schemes which are diversified across market segments and sectors. Since the S&P BSE 200 Total Return Index (TRI) captures the combination of large-cap and mid-cap stocks along with diversification; the performance of QEFoF is benchmarked against S&P BSE 200 TRI. With a single fund, diversification, one of the important tenets of investing, is taken care of. QEFoF offers diversification by the fund manager and investment style. Quantum Mutual Fund has appointed PersonalFN as a designated agency to provide research support for QEFoF. PersonalFN has been researching mutual funds for over fifteen years and also has a presence in the field of wealth management. Before investing in units of diversified equity mutual funds, QEFoF follows a comprehensive research methodology consisting of quantitative as well as qualitative parameters. Under quantitative analysis, the focus is on performance (returns + risk) across time frames and market cycles (i.e. bull and bear phases), while under qualitative aspects the investment processes & systems and consistency in the characteristics of the underlying portfolios of the respective mutual fund schemes is studied, amongst a host of other things. Meeting the fund manager personally is also a part of the process to understand the qualitative aspects of the fund under consideration. Along with prudent portfolio construction, portfolio rebalancing and review is also critical to accomplishing the stated investment objective. The process followed by QEFoF ensures that the portfolio is rebalanced adequately so that you benefit from the finest suite of equity mutual fund schemes in India. The fund manager monitors the portfolio regularly, but not so as to engage in excessive churning. You do not have to worry about which equity mutual fund schemes to add or remove from the portfolio. The fund manager and his investment team after performing intensive research will choose worthy mutual fund schemes so that the investment objective of FoF is achieved and you benefit in the long run -- whereby the risk is reduced, and gains are optimised. Instead of over-crowding your mutual fund portfolio with multiples schemes, QEFoF is an efficient way to hold promising mutual fund schemes, with a single fund. You get exposure to 5-10 open-ended diversified equity schemes of third-party mutual funds, shortlisted after extensive research. Further, your investment in QEFoF can also be held in a demat mode. This makes tracking the portfolio easy as opposed to keeping track of account statements. Investing in a mutual fund scheme attracts cost in the form of the expense ratio. Each scheme declares its monthly expense ratio depending on the administrative and management costs incurred. Quantum Equity Fund of Funds has among the lowest expense ratio in its category (0.51% p.a. for Direct Plan and 0.63% p.a. for Regular Plan). Also, since QEFoF invests only in Direct Plans offered by the underlying equity schemes, the net expense borne by the investor turns out to be lower than investing in Regular Plans. How is the performance of Quantum Equity Fund of Funds? Since its inception on July 20, 2009, the Quantum Equity Fund of Funds has delivered 13.29% CAGR (as on February 28, 2019) outperforming its benchmark, the S&P BSE 200 TRI. As depicted by the graph above, QEFoF has been generating alpha consistently and living up to its investment objective. This is mainly due to the robust comprehensive research methodology followed to select worthy mutual fund schemes for the portfolio. QEFoF invests in open-ended diversified equity funds that have been in existence for at least 3 years at the time of making investments. Sector/thematic funds are not a part of QEFoF's portfolio. Besides, the Scheme does not invest in the schemes of Quantum Mutual Fund. Thereafter, the short-listed funds are evaluated based on qualitative criteria viz. the fund house's investment systems and processes, consistency in characteristics of its portfolio among others. Funds that emerge as top performers shall form part of the final portfolio. 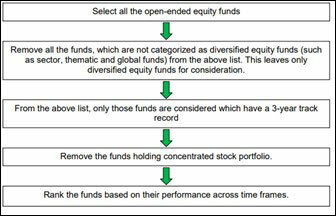 The portfolio will comprise of 5-10 open-ended diversified equity mutual funds. Not more than 20% of the net assets is invested in a single scheme with a 3-year track record. The overall exposure to a single scheme shall not exceed more than 40% of the portfolio. Not more than 25% of the net assets shall be invested in a single scheme with a 5-year track record. Currently, QEFoF holds seven open-ended diversified equity mutual fund schemes in its portfolio, well-diversified across investment styles and capitalisations. The AUM of the fund as on February 28, 2019, is Rs 31.32 crore. Who manages the Quantum Equity Fund of Funds? The QEFoF is managed by Mr Chirag Mehta. He has over 11 years of experience in the research and investments functions in the field of commodities and alternative investment strategies. Mr Mehta is a qualified CAIA (Chartered Alternative Investment Analyst), holds a post-graduate degree in commerce (M.Com) plus has a Masters in Management Studies (MMS) in Finance to his credit. Who should invest in Quantum Equity Fund of Funds? The fund is suitable for investors seeking long-term capital appreciation and those who have a moderately high-risk appetite. Moreover, if you wish to have exposure to diverse fund management styles with a single fund and leave the task of selecting the best equity mutual funds and portfolio rebalancing on the fund manager, QEFoF is apt for your portfolio*. It does away with the need to fill up and sign multiple application forms and cheques/online transactions thereto to invest in respective mutual fund schemes. How to invest in Quantum Equity Fund of Funds? You can invest in QEFoF using a single investment cheque or an online purchase transaction. Download the Key Information Memorandum and application form here. You also have the option to invest vide SIP (or Systematic Investment Plan) and STP (or Systematic Transfer Plan). Plus, for redemptions, the scheme also offers SWP or Systematic Withdrawal Plan to its investors. You even have the trigger facilitate, allowing you to specify the exit target. To know more about Quantum Equity Fund of Funds and to invest, click here. * Mutual Fund investments are subject to market risks. Read all scheme related documents carefully. Past performance is not an indicator for future returns Speak to your investment advisor for further assistance before investing. Equitymaster requests your view! 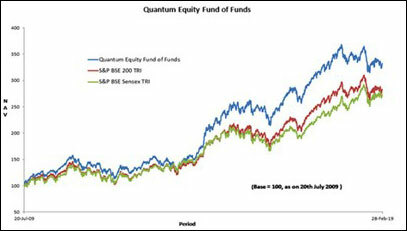 Post a comment on "Why Consider Quantum Equity Fund Of Funds To Build Your Portfolio". Click here!